Senegal (/ˌsɛnɪˈɡɔːl, -ˈɡɑːl/ ( listen); French: Sénégal), officially the Republic of Senegal (French: République du Sénégal), is a country in West Africa. Senegal is bordered by Mauritania in the north, Mali to the east, Guinea to the southeast, and Guinea-Bissau to the southwest. Senegal also borders The Gambia, a country occupying a narrow sliver of land along the banks of the Gambia River, which separates Senegal's southern region of Casamance from the rest of the country. Senegal also shares a maritime border with Cape Verde. Senegal's economic and political capital is Dakar. "One People, One Goal, One Faith"
"Pincez Tous vos Koras, Frappez les Balafons"
"Everyone strum your koras, strike the balafons"
With French Sudan, as the Mali Federation. The unitary semi-presidential republic is the westernmost country in the mainland of the Old World, or Afro-Eurasia, and owes its name to the Senegal River, which borders it to the east and north. Senegal covers a land area of almost 197,000 square kilometres (76,000 sq mi) and has an estimated population of about 15 million. The climate is typically Sahelian, though there is a rainy season. Probably from a Portuguese transliteration of the name of the Zenaga also known as the Sanhaja, or a combination of the supreme deity in Serer religion (Rog Sene) and o gal meaning body of water in the Serer language. Alternatively, the name could derive from the Wolof phrase "Sunuu Gaal," which means "our boat." The territory of modern Senegal has been inhabited by various ethnic groups since prehistory. Organized kingdoms emerged around the seventh century, and parts of the country were ruled by prominent regional empires such as the Jolof Empire. The present state of Senegal has its roots in European colonialism, which began during the mid-15th century, when various European powers began competing for trade in the area. The establishment of coastal trading posts gradually led to control of the mainland, culminating in French rule of the area by the 19th century, albeit amid much local resistance. Senegal peacefully attained independence from France in 1960, and has since been among the more politically stable countries in Africa. Senegal's economy is centered mostly on commodities and natural resources. Major industries are fish processing, phosphate mining, fertilizer production, petroleum refining, construction materials, and ship construction and repair. As in most African nations, agriculture is a major sector, with Senegal producing several important cash crops, including peanuts, sugarcane, cotton, green beans, tomatoes, melons, and mangoes. Owing to its relative stability, tourism and hospitality are also burgeoning sectors. With it being a multiethnic and secular nation, Senegal is predominantly Sunni Muslim with Sufi and animist influences. French is the official language, although many native languages are spoken and recognized. Since April 2012, Senegal's president has been Macky Sall. Senegal has been a member of the Organisation internationale de la Francophonie since 1970. Archaeological findings throughout the area indicate that Senegal was inhabited in prehistoric times and has been continuously occupied by various ethnic groups. Some kingdoms were created around the 7th century: Takrur in the 9th century, Namandiru [wo] and the Jolof Empire during the 13th and 14th centuries. Eastern Senegal was once part of the Ghana Empire. Islam was introduced through Toucouleur and Soninke contact with the Almoravid dynasty of the Maghreb, who in turn propagated it with the help of the Almoravids, and Toucouleur allies. This movement faced resistance from ethnicities of traditional religions, the Serers in particular. In the 13th and 14th centuries, the area came under the influence of the empires to the east; the Jolof Empire of Senegal was also founded during this time. In the Senegambia region, between 1300 and 1900, close to one-third of the population was enslaved, typically as a result of captives taken in warfare. In the 14th century the Jolof Empire grew more powerful, having united Cayor and the kingdoms of Baol, Sine, Saloum, Waalo, Futa Tooro and Bambouk, or much of present-day West Africa. The empire was a voluntary confederacy of various states rather than an empire built on military conquest. The empire was founded by Ndiadiane Ndiaye, a part Serer and part Toucouleur, who was able to form a coalition with many ethnicities, but collapsed around 1549 with the defeat and killing of Lele Fouli Fak by Amari Ngone Sobel Fall [fr]. In the mid-15th century, the Portuguese landed on the Senegal coastline, followed by traders representing other countries, including the French. Various European powers—Portugal, the Netherlands, and Great Britain—competed for trade in the area from the 15th century onward. In 1677, France gained control of what had become a minor departure point in the Atlantic slave trade—the island of Gorée next to modern Dakar, used as a base to purchase slaves from the warring chiefdoms on the mainland. European missionaries introduced Christianity to Senegal and the Casamance in the 19th century. It was only in the 1850s that the French began to expand onto the Senegalese mainland after they abolished slavery and began promoting an abolitionist doctrine, adding native kingdoms like the Waalo, Cayor, Baol, and Jolof Empire. French colonists progressively invaded and took over all the kingdoms except Sine and Saloum under Governor Louis Faidherbe. Yoro Dyao was in command of the canton of Foss-Galodjina and was set over Wâlo (Ouâlo) by Louis Faidherbe, where he served as a chief from 1861 to 1914. Senegalese resistance to the French expansion and curtailing of their lucrative slave trade was led in part by Lat-Dior, Damel of Cayor, and Maad a Sinig Kumba Ndoffene Famak Joof, the Maad a Sinig of Sine, resulting in the Battle of Logandème. On 4 April 1959 Senegal and the French Sudan merged to form the Mali Federation, which became fully independent on 20 June 1960, as a result of a transfer of power agreement signed with France on 4 April 1960. Due to internal political difficulties, the Federation broke up on 20 August, when Senegal and French Sudan (renamed the Republic of Mali) each proclaimed independence. Léopold Sédar Senghor was Senegal's first president in September 1960. Senghor was a very well-read man, educated in France. He was a poet and philosopher who personally drafted the Senegalese national anthem, "Pincez tous vos koras, frappez les balafons". Pro-African, he advocated a brand of African socialism. Colonial Saint Louis c. 1900. Europeans and Africans on the Rue Lebon. In 1980, President Senghor decided to retire from politics. The next year, he transferred power in 1981 to his hand-picked successor, Abdou Diouf. Former prime minister Mamadou Dia, who was Senghor's rival, ran for election in 1983 against Diouf, but lost. Senghor moved to France, where he died at the age of 96. In the 1980s, Boubacar Lam discovered Senegalese oral history that was initially compiled by the Tuculor noble, Yoro Dyâo, not long after World War I, which documented migrations into West Africa from the Nile Valley; ethnic groups, from the Senegal River to the Niger Delta, retained traditions of having an eastern origin. Senegal joined with the Gambia to form the nominal Senegambia Confederation on 1 February 1982. However, the union was dissolved in 1989. Despite peace talks, a southern separatist group (Movement of Democratic Forces of Casamance or MFDC) in the Casamance region has clashed sporadically with government forces since 1982 in the Casamance conflict. In the early 21st century, violence has subsided and President Macky Sall held talks with rebels in Rome in December 2012. Abdou Diouf was president between 1981 and 2000. He encouraged broader political participation, reduced government involvement in the economy, and widened Senegal's diplomatic engagements, particularly with other developing nations. Domestic politics on occasion spilled over into street violence, border tensions, and a violent separatist movement in the southern region of the Casamance. Nevertheless, Senegal's commitment to democracy and human rights strengthened. Abdou Diouf served four terms as president. 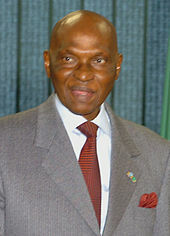 In the presidential election of 1999, opposition leader Abdoulaye Wade defeated Diouf in an election deemed free and fair by international observers. Senegal experienced its second peaceful transition of power, and its first from one political party to another. On 30 December 2004 President Wade announced that he would sign a peace treaty with the separatist group in the Casamance region. This, however, has yet to be implemented. There was a round of talks in 2005, but the results have not yet yielded a resolution. Senegal is a republic with a presidency; the president is elected every five years as of 2001, previously being seven years, by adult voters. The first president, Léopold Sédar Senghor, was a poet and writer, and was the first African elected to the Académie française. Senegal's second president, Abdou Diouf, later served as general secretary of the Organisation de la Francophonie. The third president was Abdoulaye Wade, a lawyer. The current president is Macky Sall, elected in March 2012. Senegal has more than 80 political parties. The unicameral parliament consists of the National Assembly, which has 150 seats (a Senate was in place from 1999 to 2001 and 2007 to 2012). An independent judiciary also exists in Senegal. The nation's highest courts that deal with business issues are the constitutional council and the court of justice, members of which are named by the president. Currently, Senegal has a quasi-democratic political culture, one of the more successful post-colonial democratic transitions in Africa. Local administrators are appointed and held accountable by the president. Marabouts, religious leaders of the various Muslim brotherhoods of Senegal, have also exercised a strong political influence in the country especially during Wade's presidency. In 2009, Freedom House downgraded Senegal's status from "Free" to "Partially Free", based on increased centralisation of power in the executive. However, it has since recovered its Free status by 2014. In 2008, Senegal finished in 12th position on the Ibrahim Index of African Governance. The Ibrahim Index is a comprehensive measure of African governance (limited to sub-Saharan Africa until 2008), based on a number of different variables which reflect the success with which governments deliver essential political goods to their citizens. When the Northern African countries were added to the index in 2009, Senegal's 2008 position was retroactively downgraded to 15th place (with Tunisia, Egypt and Morocco placing themselves ahead of Senegal). As of 2012[update], Senegal's rank in the Ibrahim Index has decreased another point to 16 out of 52 African countries. On 22 February 2011, Senegal reportedly severed diplomatic ties with Iran, saying it supplied rebels with weapons which killed Senegalese troops in the Casamance conflict. The 2012 presidential election was controversial due to President Wade's candidacy, as the opposition argued he should not be considered eligible to run again. Several youth opposition movements, including M23 and Y'en a Marre, emerged in June 2011. In the end, Macky Sall of the Alliance for the Republic won, and Wade conceded the election to Sall. This peaceful and democratic transition was hailed by many foreign observers, such as the EU as a show of "maturity". On 19 September 2012, lawmakers voted to do away with the Senate to save an estimated $15 million. Senegal is subdivided into 14 regions, each administered by a Conseil Régional (Regional Council) elected by population weight at the Arrondissement level. The country is further subdivided by 45 Départements, 113 Arrondissements (neither of which have administrative function) and by Collectivités Locales, which elect administrative officers. Senegal has a high profile in many international organizations and was a member of the UN Security Council in 1988–89 and 2015–2016. It was elected to the UN Commission on Human Rights in 1997. Friendly to the West, especially to France and to the United States, Senegal also is a vigorous proponent of more assistance from developed countries to the Third World. Senegal enjoys mostly cordial relations with its neighbors. In spite of clear progress on other fronts with Mauritania (border security, resource management, economic integration, etc. ), an estimated 35,000 Mauritanian refugees (of the estimated 40,000 who were expelled from their home country in 1989) remain in Senegal. Senegal is part of the Economic Community of West African States (ECOWAS). Integrated with the main bodies of the international community, Senegal is also a member of the African Union (AU) and the Community of Sahel-Saharan States. Land mines were widely used in the Casamance conflict between separatist rebels and the central government. The Senegalese armed forces consist of about 19,000 personnel in the army, air force, navy, and gendarmerie. The Senegalese military force receives most of its training, equipment, and support from France and the United States. Germany also provides support but on a smaller scale. Military noninterference in political affairs has contributed to Senegal's stability since independence. Senegal has participated in many international and regional peacekeeping missions. Most recently, in 2000, Senegal sent a battalion to the Democratic Republic of Congo to participate in MONUC, the United Nations peacekeeping mission, and agreed to deploy a United States-trained battalion to Sierra Leone to participate in UNAMSIL, another UN peacekeeping mission. In 2015, Senegal participated in the Saudi Arabian-led military intervention in Yemen against the Shia Houthis. Senegal is a secular state, as defined in its Constitution. To fight corruption, the government has created the National Anti-Corruption Office (OFNAC) and the Commission of Restitution and Recovery of Illegally Acquired Assets. According to Business Anti-Corruption Portal, President Sall created the OFNAC to replace the Commission Nationale de Lutte Contre la non Transparence, la Corruption et la Concussion (CNLCC). It is said that the OFNAC represents a more effective tool for fighting corruption than the CNLCC established under former President Wade. The mission of OFNAC is to fight corruption, embezzlement of public funds and fraud. OFNAC has the power of self-referral (own initiative investigation). OFNAC is composed of twelve members appointed by decree. Homosexuality is illegal in Senegal. According to 2013 survey by the Pew Research Center, 96% of Senegalese believe that homosexuality should not be accepted by society. Senegal is located on the west of the African continent. It lies between latitudes 12° and 17°N, and longitudes 11° and 18°W. Senegal is externally bounded by the Atlantic Ocean to the west, Mauritania to the north, Mali to the east, and Guinea and Guinea-Bissau to the south; internally it almost completely surrounds The Gambia, namely on the north, east and south, except for Gambia's short Atlantic coastline. The Senegalese landscape consists mainly of the rolling sandy plains of the western Sahel which rise to foothills in the southeast. Here is also found Senegal's highest point, an otherwise unnamed feature 2.7 km southeast of Nepen Diakha at 648 m (2,126 ft). The northern border is formed by the Senegal River; other rivers include the Gambia and Casamance Rivers. 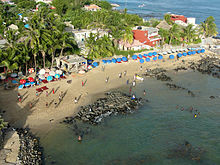 The capital Dakar lies on the Cap-Vert peninsula, the westernmost point of continental Africa. The Cape Verde islands lie some 560 kilometres (350 mi) off the Senegalese coast, but Cap-Vert ("Cape Green") is a maritime placemark, set at the foot of "Les Mammelles", a 105-metre (344 ft) cliff resting at one end of the Cap-Vert peninsula onto which is settled Senegal's capital Dakar, and 1 kilometre (0.6 mi) south of the "Pointe des Almadies", the westernmost point in Africa. Senegal has a tropical climate with pleasant heat throughout the year with well-defined dry and humid seasons that result from northeast winter winds and southwest summer winds. The dry season (December to April) is dominated by hot, dry, harmattan wind. Dakar's annual rainfall of about 600 mm (24 in) occurs between June and October when maximum temperatures average 30 °C (86.0 °F) and minimums 24.2 °C (75.6 °F); December to February maximum temperatures average 25.7 °C (78.3 °F) and minimums 18 °C (64.4 °F). 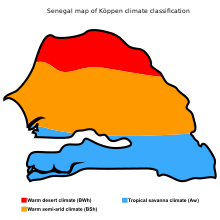 Interior temperatures are higher than along the coast (for example, average daily temperatures in Kaolack and Tambacounda for May are 30 °C (86.0 °F) and 32.7 °C (90.9 °F) respectively, compared to Dakar's 23.2 °C (73.8 °F) ), and rainfall increases substantially farther south, exceeding 1,500 mm (59.1 in) annually in some areas. In Tambacounda in the far interior, particularly on the border of Mali where desert begins, temperatures can reach as high as 54 °C (129.2 °F). The northernmost part of the country has a near hot desert climate, the central part has a hot semi-arid climate and the southernmost part has a tropical wet and dry climate. Senegal is mainly a sunny and dry country. After its economy contracted by 2.1% in 1993, Senegal instituted a major economic reform program with the support of international donors. This reform began with a 50 percent devaluation of the country's currency (the CFA franc). Government price controls and subsidies were also dismantled. As a result, Senegal's inflation went down, investment went up, and the gross domestic product rose approximately 5% a year between 1995 and 2001. The main industries include food processing, mining, cement, artificial fertilizer, chemicals, textiles, refining imported petroleum, and tourism. Exports include fish, chemicals, cotton, fabrics, groundnuts, and calcium phosphate. The principal foreign market is India with 26.7% of exports (as of 1998). Other foreign markets include the United States, Italy and the United Kingdom. Senegal has a 12-nautical-mile (22 km; 14 mi) exclusive fishing zone that has been regularly breached in recent years (as of 2014[update]). It has been estimated that the country's fishermen lose 300,000 tonnes of fish each year to illegal fishing. The Senegalese government have tried to control the illegal fishing which is conducted by fishing trawlers, some of which are registered in Russia, Mauritania, Belize and Ukraine. In January 2014, a Russian trawler, Oleg Naydenov, was seized by Senegalese authorities close to the maritime border with Guinea-Bissau. As a member of the West African Economic and Monetary Union (WAEMU), Senegal is working toward greater regional integration with a unified external tariff. Senegal is also a member of the Organization for the Harmonization of Business Law in Africa. Senegal achieved full Internet connectivity in 1996, creating a mini-boom in information technology-based services. Private activity now accounts for 82 percent of its GDP. On the negative side, Senegal faces deep-seated urban problems of chronic high unemployment, socioeconomic disparity, juvenile delinquency, and drug addiction. Senegal is a major recipient of international development assistance. Donors include the United States Agency for International Development (USAID), Japan, France and China. Over 3,000 Peace Corps Volunteers have served in Senegal since 1963. Senegal has a population of around 15.4 million, about 42 percent of whom live in rural areas. Density in these areas varies from about 77 inhabitants per square kilometre (200/sq mi) in the west-central region to 2 per square kilometre (5.2/sq mi) in the arid eastern section. About 50,000 Europeans (mostly French) and Lebanese as well as smaller numbers of Mauritanians and Moroccans reside in Senegal, mainly in the cities and some retirees who reside in the resort towns around Mbour. The majority of Lebanese work in commerce. The country experienced a wave of immigration from France in the decades between World War II and Senegalese independence; most of these French people purchased homes in Dakar or other major urban centers. Also located primarily in urban settings are small Vietnamese communities as well as a growing number of Chinese immigrant traders, each numbering perhaps a few hundred people. There are also tens of thousands of Mauritanian refugees in Senegal, primarily in the country's north. According to the World Refugee Survey 2008, published by the U.S. Committee for Refugees and Immigrants, Senegal has a population of refugees and asylum seekers numbering approximately 23,800 in 2007. The majority of this population (20,200) is from Mauritania. Refugees live in N'dioum, Dodel, and small settlements along the Senegal River valley. French is the official language, spoken at least by all those who enjoyed several years in the educational system that is of French origin (Koranic schools are even more popular, but Arabic is not widely spoken outside of the context of recitation). During the 15th century, Many European territories started to engage in trade in Senegal. By the 19th century, French powers also strengthened their roots in Senegal and thus the number of French-speaking people multiplied continuously. French was ratified as the official language of Senegal in the year 1960 when the country achieved independence. Around 15 to 20% of all men and around 2% of all women speak and understand French. In addition, some 21% of the population is partially fluent in the French language. Most people also speak their own ethnic language while, especially in Dakar, Wolof is the lingua franca. Pulaar is spoken by the Fulas and Toucouleur. The Serer language is widely spoken by both Serers and non-Serers (including President Sall, whose wife is Serer); so are the Cangin languages, whose speakers are ethnically Serers. Jola languages are widely spoken in the Casamance. Overall Senegal is home to around 39 distinct languages. Several have the legal status of "national languages": Balanta-Ganja, Hassaniya Arabic, Jola-Fonyi, Mandinka, Mandjak, Mankanya, Noon (Serer-Noon), Pulaar, Serer, Soninke, and Wolof. 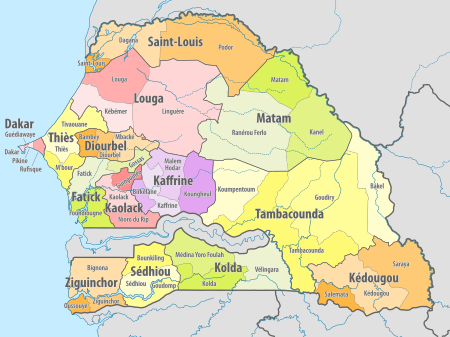 Portuguese Creole, locally known as Portuguese, is a prominent minority language in Ziguinchor, regional capital of the Casamance, spoken by local Portuguese creoles and immigrants from Guinea-Bissau. The local Cape Verdean community speak a similar Portuguese creole, Cape Verdean Creole, and standard Portuguese. 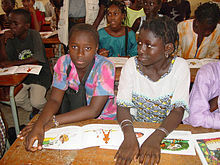 Portuguese was introduced in Senegal's secondary education in 1961 in Dakar by the country's first president, Léopold Sédar Senghor. It is currently available in most of Senegal and in higher education. It is especially prevalent in Casamance as it relates with the local cultural identity. While French is the sole official language, a rising Senegalese linguistic nationalist movement supports the integration of Wolof, the common vernacular language of the country, into the national constitution. Senegal's capital of Dakar is by far the largest city in Senegal, with over two million residents. 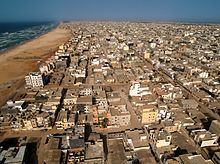 The second most populous city is Touba, a de jure communaute rurale (rural community), with half a million. Senegal is a secular state. Islam is the predominant religion in the country, practiced by approximately 92% of the country's population; the Christian community, at 7% of the population, are mostly Roman Catholics but there are still diverse Protestant denominations. One percent have animist beliefs, particularly in the southeastern region of the country. Some Serer people follow the Serer religion. The Great Mosque of Touba; home of the Mouride Sufi brotherhood, it is also one of the finest examples of Islamic architecture in Africa. A majority of the Muslims in Senegal are Sunni with Sufi influences. Islamic communities in Senegal are generally organized around one of several Islamic Sufi orders or brotherhoods, headed by a khalif (xaliifa in Wolof, from Arabic khalīfa), who is usually a direct descendant of the group's founder. The two largest and most prominent Sufi orders in Senegal are the Tijaniyya, whose largest sub-groups are based in the cities of Tivaouane and Kaolack, and the Murīdiyya (Murid), based in the city of Touba. 27% are nondenominational Muslims. The Halpulaar (Pulaar-speakers), composed of Fula people, a widespread group found along the Sahel from Chad to Senegal, and Toucouleurs, represent 23.8 percent of the population. Historically, they were the first to become Muslim. Many of the Toucouleurs, or sedentary Halpulaar of the Senegal River Valley in the north, converted to Islam around a millennium ago and later contributed to Islam's propagation throughout Senegal. Success was gained among the Wolofs, but repulsed by the Serers. Most communities south of the Senegal River Valley, however, were not thoroughly Islamized. The Serer people stood out as one of this group, who spent over one thousand years resisting Islamization (see Serer history). Although many Serers are Christians or Muslim, their conversion to Islam in particular is very recent, who converted on their own free will rather than by force, although force had been tried centuries earlier unsuccessfully (see the Battle of Fandane-Thiouthioune). The spread of formal Quranic school (called daara in Wolof) during the colonial period increased largely through the effort of the Tidjâniyya. In Murid communities, which place more emphasis on the work ethic than on literary Quranic studies, the term daara often applies to work groups devoted to working for a religious leader. Other Islamic groups include the much older Qādiriyya order and the Senegalese Laayeen order, which is prominent among the coastal Lebu. Today, most Senegalese children study at daaras for several years, memorizing as much of the Qur'an as they can. Some of them continue their religious studies at councils (majlis) or at the growing number of private Arabic schools and publicly funded Franco-Arabic schools. Small Roman Catholic communities are mainly found in coastal Serer, Jola, Mankanya and Balant populations, and in eastern Senegal among the Bassari and Coniagui. The Protestant churches are mainly attended by immigrants but during the second half of the 20th century Protestant churches led by Senegalese leaders from different ethnic groups have evolved. In Dakar Catholic and Protestant rites are practiced by the Lebanese, Cape Verdean, European, and American immigrant populations, and among certain Africans of other countries as well as by the Senegalese themselves. Although Islam is Senegal's majority religion, Senegal's first president, Léopold Sédar Senghor, was a Catholic Serer. Serer religion encompasses a belief in a supreme deity called Roog (Koox among the Cangin), Serer cosmogony, cosmology and divination ceremonies such as the annual Xoy (or Khoye) ceremony precided over by the Serer Saltigues (high priests and priestesses). Senegambian (both Senegal and the Gambia) Muslim festivals such as Tobaski, Gamo, Koriteh, Weri Kor, etc., are all borrowed words from the Serer religion. They were ancient Serer festivals rooted in Serer religion, not Islam. The Boukout is one of the Jola's religious ceremonies. There are small numbers of adherents of Judaism and Buddhism. Judaism is followed by members of several ethnic groups,[who?] while Buddhism is followed by a number of Vietnamese. The Bahá'í Faith in Senegal was established after 'Abdu'l-Bahá, the son of the founder of the religion, mentioned Africa as a place that should be more broadly visited by Bahá'ís. The first Bahá'is to set foot in the territory of French West Africa that would become Senegal arrived in 1953. The first Bahá'í Local Spiritual Assembly of Senegal was elected in 1966 in Dakar. In 1975 the Bahá'í community elected the first National Spiritual Assembly of Senegal. The most recent estimate, by the Association of Religion Data Archives in a 2005 report details the population of Senegalese Bahá'ís at 22,000. Life expectancy by birth is estimated to 57.5 years. Public expenditure on health was at 2.4 percent of the GDP in 2004, whereas private expenditure was at 3.5 percent. Health expenditure was at US$72 (PPP) per capita in 2004. The fertility rate ranged 5 to 5.3 between 2005 and 2013, with 4.1 in urban areas and 6.3 in rural areas, as official survey (6.4 in 1986 and 5.7 in 1997) point out. There were six physicians per 100,000 persons in the early 2000s (decade). Infant mortality was at 77 per 1,000 live births in 2005, but in 2013 this figure had dropped to 47 within the first 12 months after birth. In the past 5 years infant mortality rates of malaria have dropped. According to a 2013 UNICEF report, 26% of women in Senegal have undergone female genital mutilation. Articles 21 and 22 of the Constitution adopted in January 2001 guarantee access to education for all children. Education is compulsory and free up to the age of 16. The Ministry of Labor has indicated that the public school system is unable to cope with the number of children that must enroll each year. Illiteracy is high, particularly among women. The net primary enrollment rate was 69 percent in 2005. Public expenditure on education was 5.4 percent of the 2002–2005 GDP. Senegal is well known for the West African tradition of storytelling, which is done by griots, who have kept West African history alive for thousands of years through words and music. The griot profession is passed down generation to generation and requires years of training and apprenticeship in genealogy, history and music. Griots give voice to generations of West African society. The African Renaissance Monument built in 2010 in Dakar is the tallest statue in Africa. Dakar also hosts a film festival, Recidak. Because Senegal borders the Atlantic Ocean, fish is very important. Chicken, lamb, peas, eggs, and beef are also used in Senegalese cooking, but not pork, due to the nation's largely Muslim population. Peanuts, the primary crop of Senegal, as well as couscous, white rice, sweet potatoes, lentils, black-eyed peas and various vegetables, are also incorporated into many recipes. Meats and vegetables are typically stewed or marinated in herbs and spices, and then poured over rice or couscous, or eaten with bread. Popular fresh juices are made from bissap, ginger, buy (pronounced 'buoy', which is the fruit of the baobab tree, also known as "monkey bread fruit"), mango, or other fruit or wild trees (most famously soursop, which is called corossol in French). Desserts are very rich and sweet, combining native ingredients with the extravagance and style characteristic of the French impact on Senegal's culinary methods. They are often served with fresh fruit and are traditionally followed by coffee or tea. Senegal is known across Africa for its musical heritage, due to the popularity of mbalax, which originated from the Serer percussive tradition especially the Njuup, it has been popularized by Youssou N'Dour, Omar Pene and others. Sabar drumming is especially popular. The sabar is mostly used in special celebrations like weddings. Another instrument, the tama, is used in more ethnic groups. Other popular international renowned Senegalese musicians are Ismael Lô, Cheikh Lô, Orchestra Baobab, Baaba Maal, Akon Thione Seck, Viviane, Titi and Pape Diouf. Senegalese play many sports. Wrestling and football are the most popular sports in the country. Senegal will host the 2022 Summer Youth Olympics in Dakar, making Senegal the first African country to host the Olympics. Wrestling is Senegal's most popular sport and has become a national obsession. It traditionally serves many young men to escape poverty and it is the only sport recognized as developed independently of Western culture. Football is a popular sport in Senegal. In 2002, the team finished as runners-up at the Africa Cup of Nations and became one of only three African teams to ever reach the quarter-finals of the FIFA World Cup, defeating holders France in their first game. 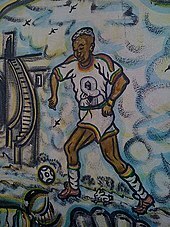 Popular players of Senegal include El Hadji Diouf, Khalilou Fadiga, Henri Camara, Papa Bouba Diop, Salif Diao, Kalidou Koulibaly, Ferdinand Coly, and Sadio Mané all of whom played in Europe. Senegal also qualified for the 2018 FIFA World Cup in Russia, playing in Group H alongside Japan, Colombia and Poland. Basketball is also a popular sport in Senegal. The country has traditionally been one of Africa's dominant basketball powers. The men's team performed better than that of any other African nation at the 2014 FIBA World Cup, where they reached the playoffs for the first time. The women's team won 19 medals at 20 African Championships, more than twice as many medals as any competitor. In 2016, the NBA announced the launch of an Elite's Academy in Africa, and more precisely in Senegal. The country hosted the Paris–Dakar rally from 1979 until 2007. The Dakar Rally was an off-road endurance motorsport race which followed a course from Paris, France to Dakar, Senegal. The competitors used off-road vehicles to cross the difficult geography. The last race was held in 2007, before the 2008 rally was canceled a day before the event due to security concerns in Mauritania. ^ "Senegal". Central Intelligence Agency. Retrieved 20 October 2018. ^ a b c d "World Economic Outlook Database, October 2018". IMF.org. International Monetary Fund. Retrieved 1 February 2019. ^ "Gini Index". World Bank. Retrieved 2 March 2011. ^ "Definition of Senegal". The Free Dictionary. Retrieved 6 November 2013. ^ "Define Senegal". Dictionary.com. Retrieved 6 November 2013. ^ a b Holloway, Beetle. "The Real Story Behind Senegal's Name". Culture Trip. ^ ""Goree and the Atlantic Slave Trade", Philip Curtin, History Net, accessed 9 July 2008". H-net.org. Retrieved 20 June 2010. ^ "Senegal in 1848" by Bruce Vandervort. ^ Journal of the African Society (Volume 11 ed.). Africa: MacMillan. 1912. p. 476. ^ 1851–1865 (PDF). University of Wisconsin-Madison Libraries. p. 167. ^ Gordon, Jane (15 April 2008). A Companion to African-American Studies. John Wiley & Sons. p. 463. ISBN 978-1-4051-5466-6. ^ a b c d e Central Intelligence Agency (2009). "Senegal". The World Factbook. Retrieved 12 October 2015. ^ "Senegal - Country report - Freedom in the World - 2014". Freedomhouse.org. Retrieved 23 August 2017. ^ "The Ibrahim Index » Mo Ibrahim Foundation". Moibrahimfoundation.org. Archived from the original on 29 December 2011. Retrieved 3 January 2012. ^ "Senegal severs ties with Iran: Senegal's foreign ministry accuses Tehran of supplying weapons to separatist rebels in its southern Casamance region". Al Jazeera. 23 February 2011. ^ "Macky Sall Senegal election win 'example for Africa' | Africa". World.myjoyonline.com. 26 August 2012. Archived from the original on 9 May 2013. Retrieved 25 November 2012. ^ "SENEGAL VOTES TO DO AWAY WITH SENATE TO SAVE MONEY". Associated Press. Retrieved 20 September 2012. ^ Statoids page on Senegal (noting that three new regions were split off on 10 September 2008). ^ List of current local elected officials Archived 19 August 2007 at the Wayback Machine from Union des Associations d' Elus Locaux (UAEL) du Sénégal. See also the law creating current local government structures: (in French) Code des collectivités locales, Loi n° 96-06 du 22 mars 1996. ^ "Mauritanian refugees refuse to leave Senegal". Al Jazeera. 8 May 2014. ^ "Senegal to send 2,100 troops to join Saudi-led alliance". Reuters. 4 May 2015. ^ a b "Constitution of Senegal (Article 1)" (PDF). Archived from the original (PDF) on 30 September 2015. Retrieved 4 August 2015. ^ "Public Anti-Corruption Initiatives". Business Anti-Corruption Portal. Retrieved 27 March 2014. ^ Bearak, Max; Cameron, Darla (16 June 2016). "Here are the 10 countries where homosexuality may be punished by death". The Washington Post. ^ "The Global Divide on Homosexuality." pewglobal. 4 June 2013. 4 June 2013. ^ "Senegal High Point". SRTM. ^ "Dakar, Senegal Climate Information – ClimateTemp.info, Making Sense of Average Monthly Weather & Temperature Data with Detailed Climate Graphs That Portray Average Rainfall & Sunshine Hours". ClimaTemps.com. 22 July 2011. Retrieved 29 March 2012. ^ "Weather rainfall and temperature data". World Climate. ^ "OHADA.com: The business law portal in Africa". Retrieved 22 March 2009. ^ "Economy of Senegal". www.chinadaily.com.cn. Retrieved 23 August 2017. ^ "Peace Corps Senegal". Pcsenegal.org. Retrieved 20 June 2010. ^ Mercier, Paul (1965). Van den Berghe, Pierre (ed.). Africa: Social Problems of Change and Conflict. San Francisco: Chandler Publishing Company. pp. 285–296. ASIN B000Q5VP8U. ^ Phuong, Tran (9 July 2007). "Vietnamese Continue Traditions in Senegal". Voice of America. Archived from the original on 11 July 2007. Retrieved 27 August 2008. ^ Fitzsimmons, Caitlin (17 January 2008). "A troubled frontier: Chinese migrants in Senegal" (PDF). South China Morning Post. Archived from the original (PDF) on 11 May 2011. Retrieved 31 March 2009. ^ "Boost for the reintegration of Mauritanian returnees". UNHCR News. 26 November 2008. Retrieved 12 January 2010. ^ "World Refugee Survey 2008". U.S. Committee for Refugees and Immigrants. 19 June 2008. Archived from the original on 28 May 2010. ^ José Horta (12–25 April 2006). "A Língua Portuguesa no Senegal". Instituto Camões. Archived from the original on 4 March 2016. Retrieved 10 December 2014. ^ Pierre Cherruau (19 August 2012). "Le Sénégal est-il encore un pays francophone?". Retrieved 19 August 2012. ^ a b Agence Nationale de la Statistique et de la Démographie (2005). "Situation économique et sociale du Sénégal" (PDF) (in French). Government of Senegal. Archived from the original (PDF) on 25 June 2008. Retrieved 18 November 2008. ^ "The World Factbook — Central Intelligence Agency". www.cia.gov. Retrieved 23 August 2017. ^ Conklin, Alice L. A Mission to Civilize: The Republican Idea of Empire in France and West Africa, 1895–1930. Stanford University Press, 1997. ISBN 0-8047-2999-9. p. 27. ^ "Chapter 1: Religious Affiliation". Pewforum.org. 9 August 2012. Retrieved 23 August 2017. ^ Hans Bressers; Walter A. Rosenbaum (2003). Achieving Sustainable Development: The Challenge of Governance Across Social Scales. Greenwood Publishing Group. pp. 151–. ISBN 978-0-275-97802-0. ^ 'Abdu'l-Bahá (1991) [1916–17]. Tablets of the Divine Plan (Paperback ed.). Wilmette, IL: Bahá'í Publishing Trust. pp. 47–59. ISBN 0-87743-233-3. ^ Hassall, Graham (c. 2000). "Egypt: Baha'i history". Asia Pacific Bahá'í Studies: Bahá'í Communities by country. Bahá'í Online Library. Retrieved 24 May 2009. ^ Bahá'í International Community (28 December 2003). "National communities celebrate together". Bahá'í International News Service. Archived from the original on 12 January 2013. ^ "Most Baha'i Nations (2005)". QuickLists > Compare Nations > Religions >. The Association of Religion Data Archives. 2005. Retrieved 4 July 2009. ^ a b (in French) ANSD Archived 17 January 2012 at the Wayback Machine Retrieved 10 December 2013. ^ a b c d e "Human Development Report 2009 – Senegal". Hdrstats.undp.org. Archived from the original on 15 July 2010. Retrieved 20 June 2010. ^ UNICEF 2013, p. 27. ^ Baba Diop. "Après dix années d'interruption : Les RECIDAK nouvelles arrivent en 2014" (in French). Africatime. Archived from the original on 30 November 2016. Retrieved 30 November 2016. ^ "Senegal to be 1st African Olympic host at 2022 Youth Games". Washington Post. Retrieved 10 September 2018. ^ "Senegal first African nation to host an Olympic event". www.aljazeera.com. Retrieved 10 September 2018. ^ "Sports in Africa: Communication and Media". Ohio University. Retrieved 3 April 2015. ^ Skelton, Rose; Werman, Marco (9 June 2011). "Wrestling As a Solution to Poverty in Senegal". PRI. Retrieved 3 April 2015. ^ "NBA to open academy in Africa in 2017 - NBA.com". www.nba.com. Retrieved 26 December 2016. ^ Hamilos, Paul (4 January 2008). "Dakar rally cancelled at last minute over terrorist threat". The Guardian. Retrieved 10 February 2018. "Senegal". The World Factbook. Central Intelligence Agency.